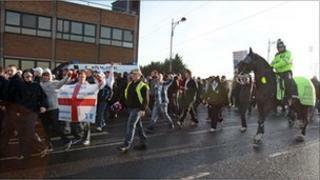 Two men have been charged following protests by the English Defence League (EDL) and rival groups in Peterborough. About 1,000 officers policed Saturday's demonstrations by the EDL, Unite Against Fascism and the TUC. A 24-year-old man from Wellington Street in the city has been charged with affray. A man, 22, from Heathyfields Road, Farnham, Surrey, has been charged with assaulting a police officer. They will appear in court at a later date. Both have been released on bail. Nine others have been arrested, including two boys, aged 16 and 17 and from north Lincolnshire, who were given police reprimands for possession of an offensive weapon. A 16-year-old boy from Wolverhampton held on suspicion of affray and assaulting a police officer has been released on bail. A 29-year-old man from Bedworth, in Warwickshire, who was arrested on suspicion of assaulting a police officer, has also been released on bail along with four men who were arrested on suspicion of public order offences at Peterborough railway station. Three of the men, aged 18, 21 and 34, are from Nottingham while one, a 24-year-old, is from Leicester.